The Violin Shop: What are Violins, Violas, & Cellos Made Of? A friend of ours on Facebook recently sent us a message and asked, "what wood works best for different parts of the cello, and why?" So we sat down at the computer, as is our routine for questions of this sort, to pull up a link to our blog entry about instrument materials. Wouldn't you know it, we didn't have one! This is a question that often confuses instrument buyers and string players alike. The falsely satisfactory conclusion, "they're made of wood, except for the strings; I think they're steel," is too often drawn in response to an issue that is far more in depth than that. In one sense, though, the answer is quite simple and almost always consistent for modern violins, violas, and cellos- Maple is used for the back, sides and neck; Spruce is used for the top and the fingerboard is made from Ebony. But Spruce and Maple are broad categories of trees that encompass several species. 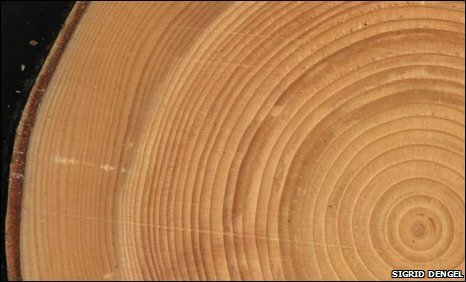 The species of wood is the primary variable concerning sound, visual aesthetic, and durability, however the wood's age, grain structure, and cut style, also play pivotal roles in these attributes. The most fundamental method of altering the sound of an instrument through material composition is to vary the species of woods used. Although the fingerboard, tailpiece, and pegs are consistently ebony (with boxwood, rosewood, or carbon graphite tailpieces gaining in popularity; Fein's Peg Blog) with a maple bridge, the woods used in the body, neck, and scroll of the instrument undergo frequent experimentation. Despite this, various species of maple (comprising the back, sides, neck, and scroll) and spruce (comprising the top) find themselves at home in an instrument more often than any other tree species. Andy Fein, the violin maker at Fein Violins, uses maple and spruce from the Hindu Kush region, a high altitude, mountainous, and ideal growing area (at least as far as instrument wood is concerned) on the borders of Pakistan, India, and China. The high altitude makes for short growing seasons. Short growing seasons mean tighter grain in a tree. There have been wood cutters cutting and air drying wood for musical instruments in the area for centuries. Andy has found this wood to be aged longer and acoustically superior to most of the readily available European wood. Wood is often selected from northern Europe, where the dry, cool climate allows for slow growth to maximize structural integrity without sacrificing the desired density, consistency, or attractive ring pattern. American woods are characteristically hard, more difficult to carve, and have less tonal flexibility than their European or select Asian counterparts. As a result, most makers stay away from American materials and a large portion of similarly hard Asian species. 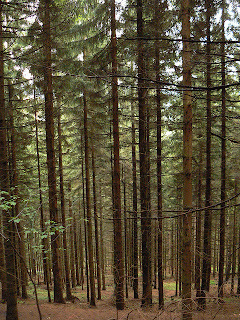 Within fine European woods, though, makers have found success with a variety of species. Many old Italian makers, including the Stradivari, Rugeri and Guarneri families, used willow, poplar, or select fruit trees as a substitution for maple in their cellos with great success. A number of old English makers made good use of certain species of beech wood (a few Cremonese beech instruments exist in addition) or English sycamore in their violins and violas as well. Using wood that has been adequately aged (meaning 'air dried' - not to be confused with the age of the tree before harvest) is essential to the construction of a healthy sounding, stable instrument. 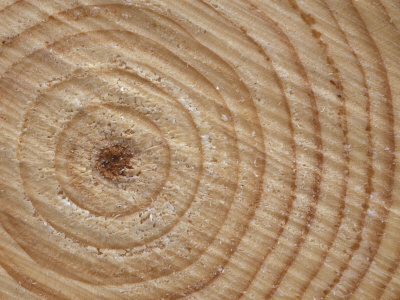 The primary goal of aging is to allow moisture to leave the wood. Making an instrument out of moist wood results in significant warping after it is finished and a low sound quality. A low water content is not the only goal of aging, however. A number of other chemicals evaporate, and resins have time to harden and become structural, therefore sound producing, components of the wood. 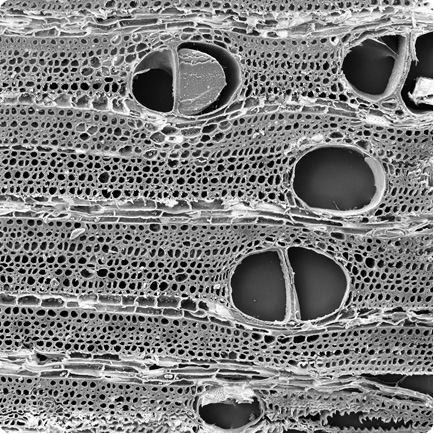 The changing chemical nature of the wood modifies the cellulose fiber structure that comprises a majority of the sample. 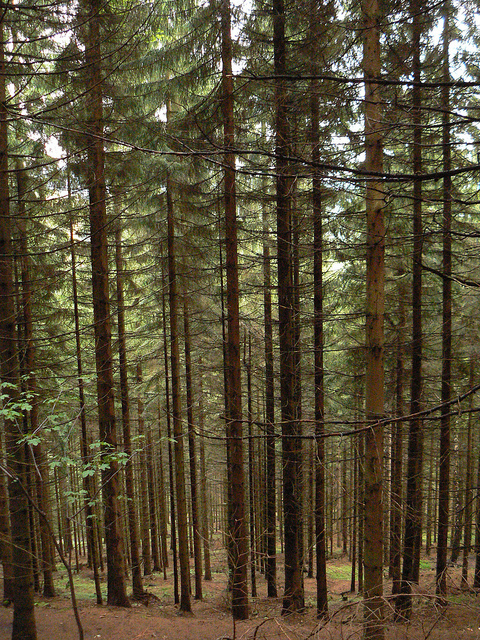 It has also been shown that woods react less to varying humidity levels as they grow older. Most makers agree that eight to ten years is adequate time for aging, but longer is definitely better. At Fein Violins, Andy Fein uses wood that has been aged at least twenty years, sometimes using wood that was harvested more than fifty years ago. The grain pattern of wood plays a large role in an instrument's sound production and rigidity. In this case, the common belief that finer grain wood is of higher quality is not always true. As a matter of fact, both old and contemporary makers suggest the use of somewhat wider grain spruce. It is less dense, lighter, and resonates more easily than a piece with a very tight grain. As in most things with string instruments, there is a balance: too tight of a grain will give a harsh sound, too wide of a grain will be too soft and give a 'mushy' sound. Grain width in maple does affect strength, however, so makers will often elect to use a fine grain back to strike a balance between sound and fragility. Fine grain maple is now rare, so older instruments have a consistently narrower grain back than newer instruments. On both the top and the back, the grain is running from the neck area down to the tailpiece area. The stripes that you see on the back of a beautiful violin that run from side to side are not the grain. They are the 'flame'. On a quarter-cut piece of maple, the flame runs at an angle approximately 45 to 90 degrees to the grain. The cut style of a piece of wood is what gives an instrument its strength and beauty. 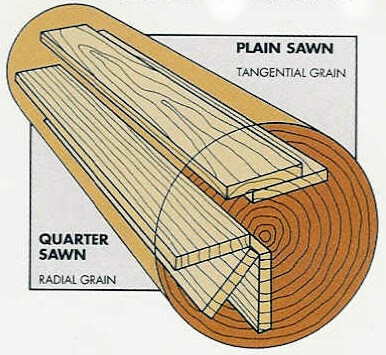 The two most commonly used cuts are the quarter cut, which Andy Fein uses, and slab cut (see illustrations below). A slab cut piece of wood is less elastic and less durable than a quarter cut piece, so it is never used in the spruce top of an instrument. Maple, however, is more durable and has to withstand less stress on the back and sides of the instrument, so a certain level of structural compromise is acceptable (the wood must be thickened 10%-20% to account for a slab cut). This often creates a unique and appealing pattern, especially when varnished. Rigidity, however, is generally prioritized over aesthetic pleasure so quarter cut wood is used on the majority of violins, both old and new. Thank you once again to our curious friend for bringing this topic to our attention. We hope your questions have been answered. For a more detailed explanation of the topics we've addressed and discussion of some more minute details pertaining to wood selection feel free to visit a section of Michael Darnton's book on instrument construction.